Lexus has revealed a fully functioning hoverboard. The hoverboard doesn't need electricity to work, it uses a permanent magnet and liquid nitrogen cooling, down to -197 degrees keeping the superconductor cold. Essential to the hoverboard working is a metal track, hidden under the specially constructed "Hoverpark" skate park. The Hoverpark was constructed in Barcelona, using around 200 metres of magnetic track set beneath the surface of an area similar to a conventional skate park. This gives the opportunity to demonstrate tricks that no skateboarder could ever perform, including travelling across water. The Lexus Hoverboard features two cryostats, reservoirs which contain superconducting material, kept at the aforementioned -197 degrees through immersion in liquid nitrogen, creating cool-looking steam. The board is placed above a track fitted with permanent magnets to achieve magnetic levitation. Dr Oliver de Hass, CEO of evico, said: "The magnetic field from the track is effectively 'frozen' into the superconductors in the board, maintaining the distance between the board and track - essentially keeping the board in a hover. The force is strong enough that the rider can stand and even jump on the board." A short film - Slide - captures the success of the latest project in Lexus's 'Amazing in Motion campaign', together with the new GS F saloon, the forthcoming addition to Lexus's F-designated range of high-performance models. The task of putting the machine through its paces fell to international pro-skateboard star Ross McGouran, who said: "I've spent 20 years skateboarding, but without friction it feels like I've had to learn a whole new skill, particularly in the stance and balance you need to ride the hoverboard." Mark Templin, Executive Vice President Lexus International, said: "We set out to push the boundaries of technology, design and innovation to make the impossible possible, collaborating with partners who share our passion for creating enjoyment out of motion. "As we combined our technology and expertise, we discovered that making a hoverboard isn't an easy process. We've experienced highs and lows and have overcome a few challenges, but through mutual determination we have created a demonstration of our philosophy in design and technology to create Amazing in Motion." 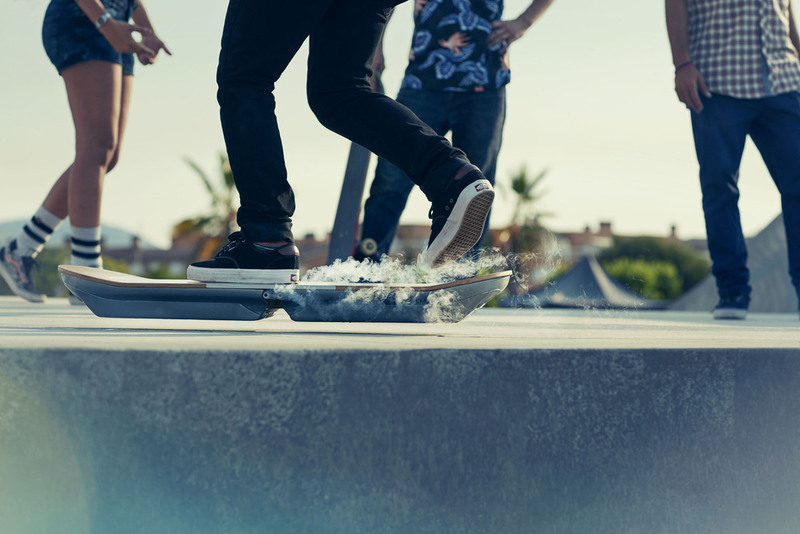 While potentially appearing like a publicity stunt, the Lexus Hoverboard is actually genuine!